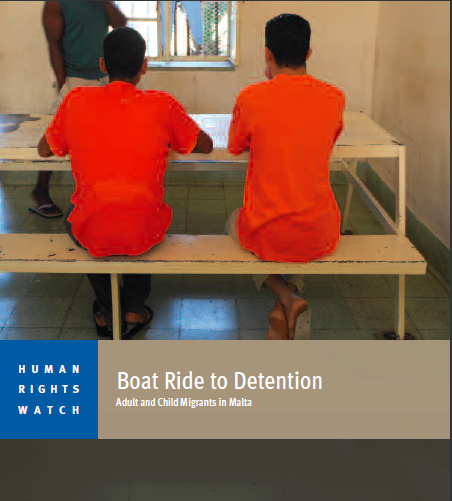 Human Rights Watch has issued a report, “Boat Ride to Detention – Adult and Child Migrants in Malta”, documenting the treatment of migrants and asylum seekers arriving by boat in Malta and concluding that the mandatory detention policy violates international law. “Summary – Malta routinely detains an average of 1,500 people per year, including children, who arrive in the country by boat without permission, or ‘irregularly.’ These are migrants and asylum seekers, typically from Somalia, Eritrea, and other sub-Saharan African countries, who travel to Europe fleeing persecution or in search of a better life. Many have fled violence and conflict, and almost all have made an arduous journey, taking months to cross the Sahara and travel north through Libya. The last stage of that journey is a perilous, multiday trip across the Mediterranean, typically in overcrowded vessels that are not seaworthy, and without enough food, water, or fuel, before they reach Maltese shores or are intercepted at sea by the Armed Forces of Malta. Boat migrants arriving in Malta are taken straight to detention if they lack an entry visa (as they virtually all do). This report addresses their arbitrary, indiscriminate, and unfair detention. The report focuses on those who arrive in Malta by boat, as migrants who arrive in Malta by air for the most part are not detained, even if they enter under false pretenses or subsequently claim asylum. Asylum seekers who arrive by boat are detained for up to 12 months, and migrants who do not apply for asylum, or whose asylum claims are rejected, can be detained for up to 18 months. Under international law migrants who do not have permission to enter or stay in a country may be subject to detention, in certain circumstances, and also may be subject to safeguards. However in Malta, the detention policy operates in an automated, indiscriminate, and blanket manner in violation of international law. Malta’s detention policy is part of flawed approaches to migration, both by Malta itself and by the European Union (EU). The central Mediterranean migration route—typically from Libya to Malta or Italy—is a major entrance point to the EU. Since 2002, approximately 15,000 migrants have reached Malta by this route, some intentionally, many by mistake as they stumble across the small island country while hoping to reach Italy. While the number of migrants arriving in Malta is low in absolute terms, Malta now has the highest number of asylum seekers relative to the national population of any country in the industrialized world. Malta, a country of only 400,000 people, received 20.1 asylum seekers per 1,000 inhabitants in the years 2007-2011, whereas France, the EU member state receiving the largest number of asylum seekers in absolute terms in 2011, received about 3 per 1,000. Although migrants have been traveling this migration route—in higher or lower numbers— for some ten years, neither Malta nor the EU has developed a sound policy that either respects migrants’ human rights or that addresses the high burden placed on Malta. EU asylum rules mean that member states at EU borders sometimes are forced to assume responsibility for a vastly disproportionate share of migrants and asylum seekers. The Dublin II regulation, promulgated in 2003, mandates that an individual’s asylum application must be processed in the country where the individual first entered the EU. This places an unfair burden on Malta, which must process these asylum applications in-country and which is obliged to accept the return of any asylum seekers whose first port of entry in the EU was Malta. The EU has taken some steps towards mitigating this burden, for instance by relocating recognized refugees from Malta to other EU states and providing limited financial support. But these steps have been insufficient to assist Malta in meeting migrants’ needs. The case of Malta, like that of Greece, shows the need to revise the Dublin II regulation to permit greater burden sharing in processing and hosting asylum seekers, rather than insisting on the country of first arrival as the primary factor in assessing member state responsibility. Malta’s arbitrary detention policy, in addition to violating international standards, does not work to deter migrants from landing on its shores. Migrants may not intend to travel to Malta, and indeed the boats in which they travel lack navigational equipment that would enable them to choose their destination. Some migrants Human Rights Watch spoke with said they did not even know that Malta existed as a country before they landed there. Though Malta’s burden is disproportionately large, detention is neither a legal nor a sound response to boat migration in the central Mediterranean. Both Malta and the EU should enact new policies to respond to their legal obligations to uphold migrants’ rights. Malta should allow detention of migrants only in exceptional circumstances, with individualized determinations, and access to procedures to challenge detention. Malta should treat those who claim to be children as such pending the outcome of age determination proceedings, and release all those with pending claims from detention. The EU should reform the Dublin system by having the Dublin regulation take into account equitable burden-sharing among member countries. Click here for link to statement. Also click here for 22 March UNHCR urgent call for action by the Italian authorities to alleviate overcrowding on Lampedusa.